Last week, M.I.A. released “Borders,” a rallying cry for the current refugee crisis. 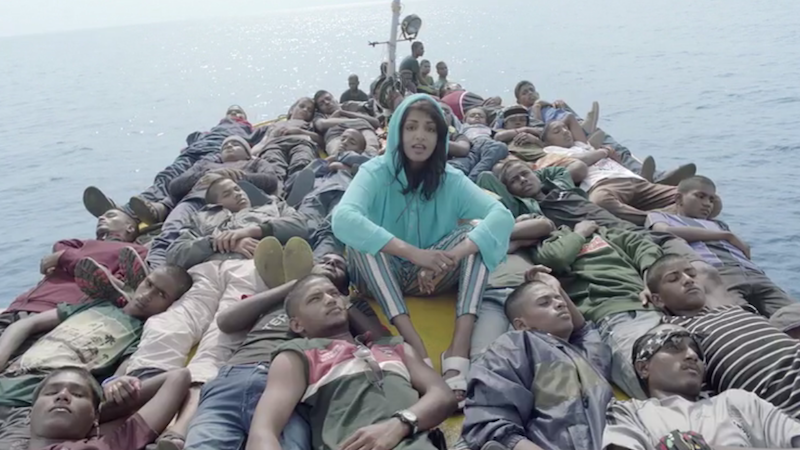 Today, she shared the song’s self-directed video, which shows the singer accompanying refugees as they scale barbed-wire fences, pack themselves on crowded boats and wade through the ocean during their journey. M.I.A., aka Maya Arulpragasam, has been vocal about the crisis on Twitter, bringing up the fact that Steve Jobs was the son of a Syrian refugee in a tweet from September. “The world I talked about ten years ago is still the same. that’s why it’s hard for me to say it again on a new LP,” she says in a more recent tweet. Stereogum pointed out M.I.A.’s jersey, which reads “Fly Pirates,” but written in the logo for luxury airline, Emirates. M.I.A. wades through water in one scene as a boat filled with refugees is seen in the background. A date for Matahdatah has not yet been announced.